Earlier this month we have mentioned the announcement of the ScryptGuild pool in their Alfa stage with invite only access and now the pool has moved to Beta stage and is open for free registrations. ScryptGuild is a pool with multiple alternative crypto currencies and an automatic switching algorithm that allows you to mine the most profitable crypto at the moment. It is similar to Multipool and the likes of it, however ScryptGuild offer some extra features that make it more attractive. For example you can set only one mining pool and switch to different cryptos to be mined on per worker basis directly from the web interface, there is also an option to directly sell your alternative coins that you have mined for BTC. Not to mention that the list of alternative cryptos is more up to date based on the more profitable coins at the moment and not keeping coins that you will probably not want to mine anymore like in Multipool for example. ScryptGuild uses PPLNS system for distributing miners earnings or Pay per Last N Shares. This is a payment method which does not allow for pool hopping because it pays for work done previously, rather than paying for work based on the concept of “rounds”. 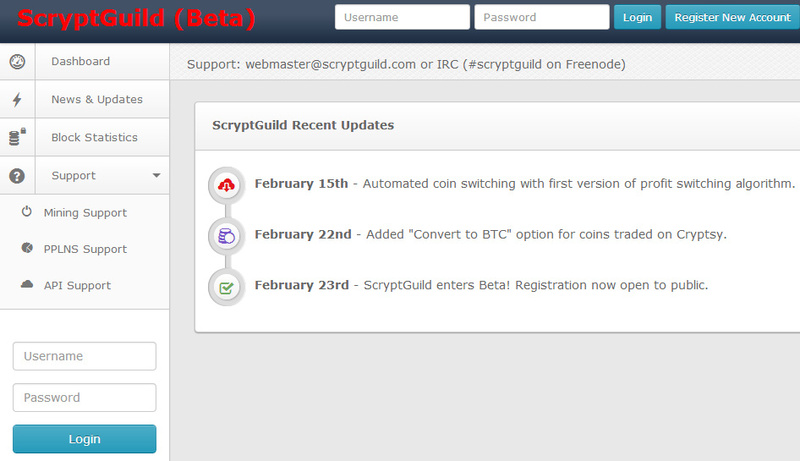 ScryptGuild applies payments to the 5 most recent shifts: The active shift, and 4 recently finished (“open”) shifts. Payments are applied on a per coin basis, using your score on that coin vs the total pool score on that coin. Shifts are closed every hour, one minute after the hour. The pool fee is 2% and the current hashrate of the pool is already about 2150 MHS. You can set the minimum difficulty level starting from 16 and going up for each worker independently, so it is also a goo d place for low hashrate miners such as Nvidia-based GPUs or small Scrypt ASICs like the USD DualMiners. We have been using the pool for a few days already and like the stability and ease of use, along with the useful extra features that it offers, including the direct sell for BTC from the pool with a slightly higher fee than if you move your coins to an exchange and sell them there (you can still do that if you wish). So we have said good-bye to Multipool and have switched to ScryptGuild completely for our main alternative profit based mining pool. And our backup pool for a while already is LTC Rabbit, though at the moment the extra altcoin bonus that this pool offers is rarely seen and most of the time we are mining LTC directly there instead of alt coins. Still good for a backup pool though as it is stable and runs reliably, so we would still recommend it as a good backup option. The combination between the two pools works like a charm for us, so we do recommend to try it out yourself if you still hasn’t done so.